MetalRockNews: Matt Sorum about Scott Weiland: "He was definitely one of the greatest frontmen"
Matt Sorum about Scott Weiland: "He was definitely one of the greatest frontmen"
Matt Sorum was recently interviewed by SiriusXM about the death of his former Velvet Revolver bandmate Scott Weiland, you can read some excerpts below. He said: "On December 3 me and Duff were gonna meet for dinner and we were gonna go see the Gary Clark Jr. show in Hollywood. And Duff called me at about 7:30; I think we found out pretty close to when things happened….Then we decided to go have something to eat, just to discuss what we were gonna do. And then we decided to pass on the Gary Clark show, because… out of respect for Scott, and just to sort of capture our thoughts." About his feelings for his fallen ex-bandmate: "I don't know how I felt initially, 'cause I can't say it was a shock, but it was definitely… I wasn't expecting it, because I felt like Scott was gonna be here, hopefully, longer than this. It's like you lived a lot of life together. It was a big chunk of life, as Duff said in the post that he put out for the band." He continued: "In the end, obviously, we had our differences and the band split up, but the wave of emotions that you feel is more like a family member. It's like if you had a family member that maybe you didn't get along with great, but you still loved them. So that's the feeling. And then I started reflecting on the beginnings of the band and that's when I started to get emotional, because we did great things together. We traveled the world together. Scott made the music come to life." 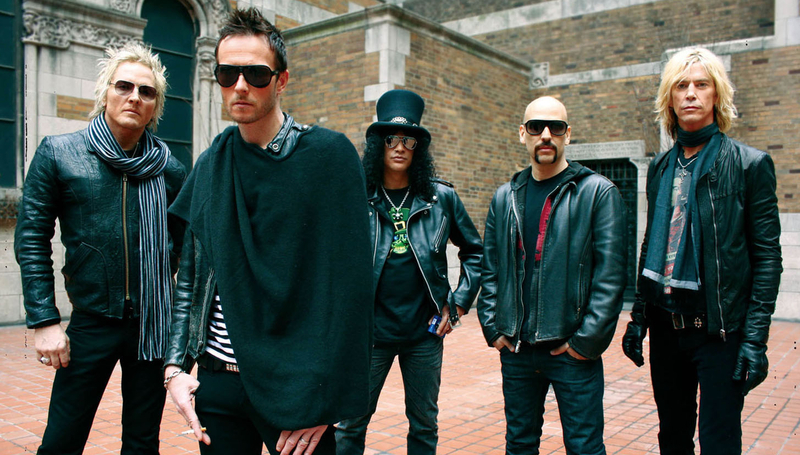 About Scott Weiland's drug-addiction battles: "We all knew what we were signing up for, but those early years of the band and the success… Man, I've gotta tell you, of anything I've done in my career, that was the highlight for me. And I think it's because it was something we all built together. The odds were against us. Scott came in and really put the icing on the cake, and all of a sudden, boom, we were off. I remember when he took the demos. He said, 'I like this song. I like this song.' He knew exactly what he was gonna do. And he grabbed thirteen of our riffs… thirteen or fourteen of the riffs… And it was just riffs, you've gotta remember — just guitar stuff with grooves. And he came back with 'Slither' and 'Fall To Pieces' and 'Big Machine' and 'Dirty Little Thing' within, like, two weeks. And we went, 'Oh my God! We've got a record.' Obviously, we dropped 'Set Me Free' first [as part of 'The Hulk' soundtrack], which was the song that ended up getting us signed as a band." He continued: "All of us had been through so much with all of our other bands. We'd been at the top and then we'd been in a very deep valley, you know, the wild ride of rock and roll, right? And then all of a sudden, man, we were on fire again, lightning in a bottle. We were off and running and the machine cranked up… We had that first great run with 'Contraband' when we were like kids again; I felt like I was 25. And we all got in really great shape. And Scott had a lot to do with that. Scott was always kind of a very fashiony guy; he wanted the band to look cool. He wouldn't tell us how to dress or anything, but he was, like, 'Hey, man, let's do this. Let's just strip it down. Let's go street rock and roll.' And we were, like, 'Okay, cool.'" Sorum added: "When we did the 'Slither' video, I remember going out… We had to go… [laughs] We had to go visit him. He was at a rehab, because he got arrested right before the [completion] of the album. And we all rallied around him. I mean, Duff took him up to Seattle and took him to this mountain area where they did martial arts. We were all trying to help, because we had all gotten clean. And then when we did 'Slither', the video, he had such a vision for it. We just had a great rapport in the beginning." Sorum said that the launch of Velvet Revolver was the high point of his career: "I remember me and Duff McKagan came out of a… We were coming out of the subway in New York, and he's two guys who were in Guns N' Roses, right? And we came out of the subway, and this guy looks over, and he goes, 'Hey, you're Duff and Matt from Velvet Revolver.' And I looked over at Duff. I went, 'Oh my God! That's the first time I've ever heard that.' And it was a very pivotal point for us, because now we'd created something new, modern, but at the same time, it was still great rock and roll. So I've gotta thank Scott for that." "I think me and Scott were probably the most outspoken ones in the band; Slash and Duff tend to be a little bit more quiet. And we had the most outspoken moments, maybe, on social media and whatnot. But the reality is, that's like a brotherly thing." He continued: "In the end, I just want the world to know that I feel like I made my peace with Scott. I saw him in New York at a show we did together maybe about… I guess it was about two years ago. I had this band called Camp Freddy and we invited Scott to come. And everyone said, 'Is that cool if we invite Scott?' I was, like, 'Yeah.' 'Cause we had done two shows after Velvet Revolver split with Scott. We did one show for a friend of Dave's that passed away, and we did one reunion gig. And me and Scott had a conversation. He apologized, I apologized. We made some amends. We were able to say, 'Hey, man, let's move forward. Let's just let the old stuff go.' And then when we were in New York, we had a really great time together. And after that, we didn't really stay close, but I felt like it at least got past that point… it's almost like when you have an issue with somebody and you finally get to have that conversation and then it's like okay again, kind of thing. And that's really where we left it. And then we sort of all ventured off into our own musical journey." Sorum wants people to remember Weiland for his musical accomplishments and not for his often-turbulent personal life. "I'd like to say that I feel that he had an incredible musical journey and I was glad to be a part of that, and, you know, just blessed to be with a great frontman in my life, and Scott was definitely one of the greatest, one of the greatest, for sure. And I want people to focus on that part; I want people to look at music." He added: "These characters in rock and roll that we've lost through the ages, their soul and their heart and everything that they felt in their life goes into their music, and they do that for us because whatever pain or hurt or anything they're going through, that's what music does for all of us. It's, like, with what's going on in the world right now, and what happened in Paris to the Eagles of Death Metal, the only thing we can say is that one thing that we all can hold in our hears is the music. So I just want people just to remember that part of him and not focus on the obvious. Because that pain and that part of him was the music; you have to remember that. And his journey was done. And, unfortunately, that's part of the story, and that part of the story says the music will remain and his journey is over and he's moved on."